When it comes to infrastructure security, it’s important to always implement both monitoring and controls — so you’re constantly verifying that your controls are actually working. Take this self-assessment to analyze your cloud infrastructure security practices. At the end, you will get specific recommendations for improving automation and security at scale. Which of the following best describes how your team delivers and runs software in your environment? Are either of the following statements true for your organization? (1) Our employees do not often need access to systems to debug software. (2) We use service discovery to standardize how servers find one another. Which of the following best describes how your services establish trust between each other? Which mode is your mandatory access system (think AppArmor or SELinux) control in? You can learn more about what this means for your organization after completing Part 2 of this assessment. Which of the following better describes your organization? Do you proactively look for suspicious behavior and use your data for incident response? Can you detect process execution patterns for unexpected behavior or remote code executions? Do you use real time data about runtimes to automatically reconfigure parts of the infrastructure, such as automatically closing ports on firewalls, removing unused access for servers to infrastructure APIs, etc.? Continue to see your results! This sample assessment covers one of Threat Stack’s Five Principles. It is intended to help you understand how mature the monitoring and controls you’ve implemented are for your Runtime and Services. Interested in Seeing the Rest of the Framework and 4 Remaining Principles? 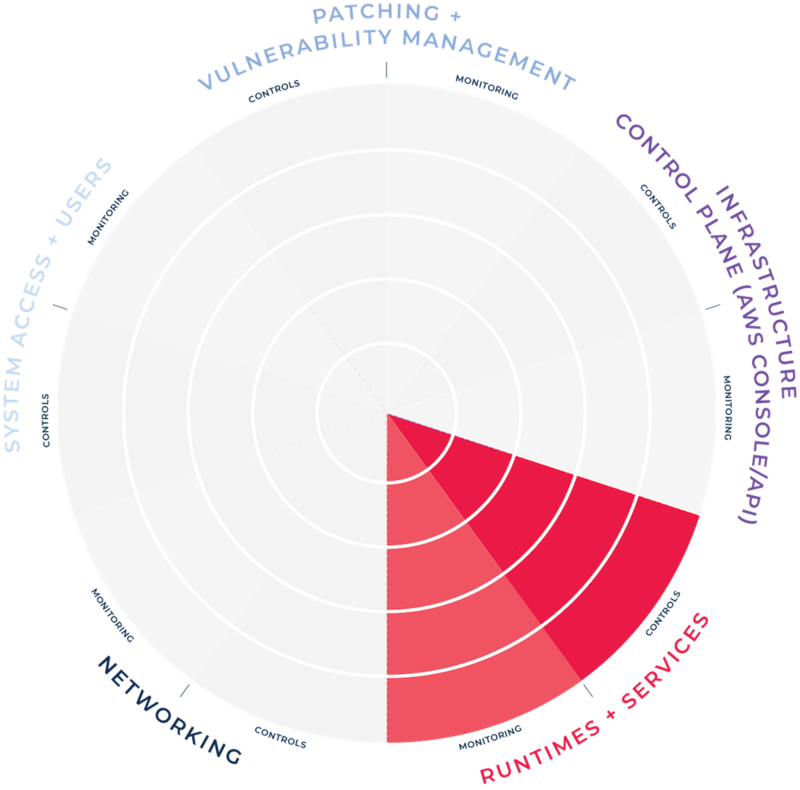 The Threat Stack Cloud SecOps Maturity Framework is designed to help companies align security and operations to reduce risk and improve operational efficiency. The framework is divided into five principles, pictured around the circle below, that each fortify different aspects of your infrastructure. This assessment is intended to show you one of the five. Controls are only effective when they’re enforced. The framework contains levels for both monitoring and controls, so companies can ensure that the controls that have been put in place are actually working. 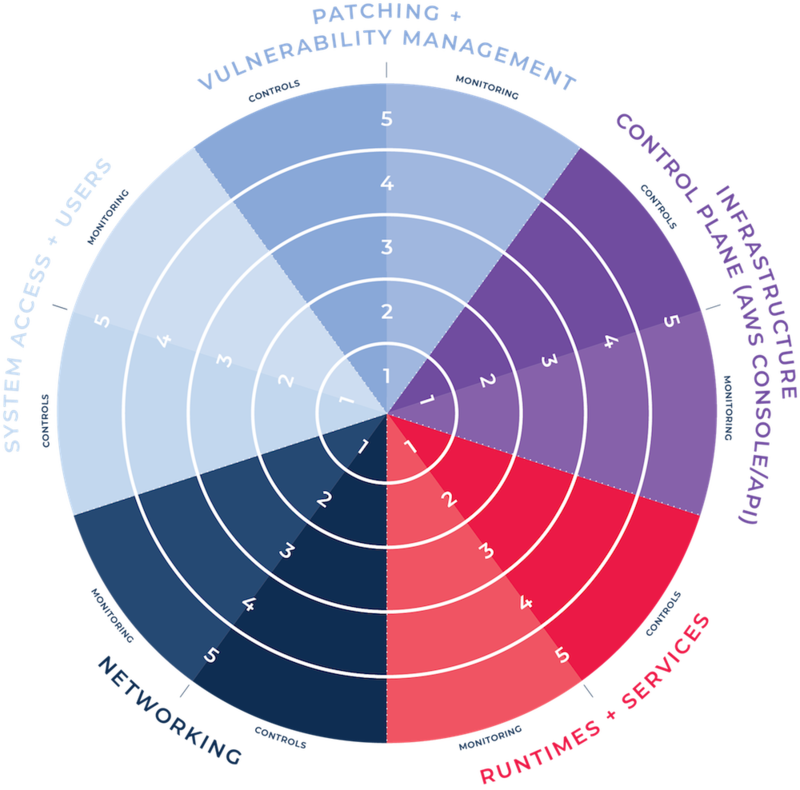 The Framework contains five maturity levels, which range from ad hoc processes (Level 1) to optimized (Level 5). Once you’ve achieved Level 5, you can start to determine your own next steps to continually improve. 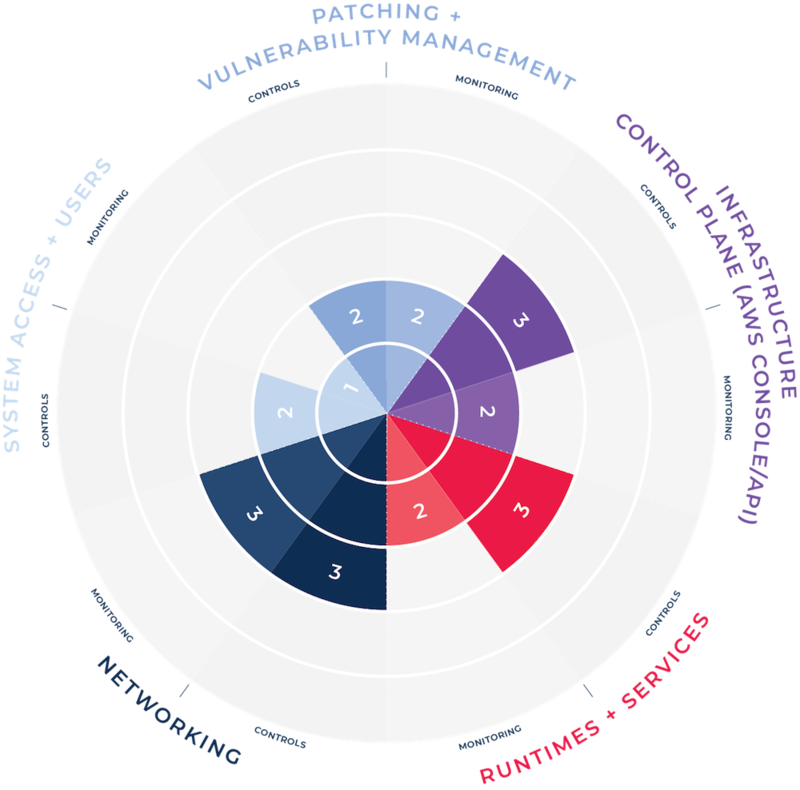 Threat Stack’s Complete Cloud SecOps Maturity Framework® includes tangible steps to take to mature your organization. Software is delivered to and runs in environments based on manual intervention. There are no standards for how it is delivered or is supposed to execute. Software is delivered to and runs in environments based on automation. All software runs as the same service user on specific servers (one service per server), logs to a deterministic location, and its configuration is rendered to a deterministic location by configuration management. Services never run as root. Employees generally do not need to access systems to debug running software. Service discovery is performed with internal systems (DNS, centralized load balancers, etc.). Services establish trust between each other before communicating (protocol layer or below). Software is only able to access the specific file system locations that it needs to with the least privileges feasible. A Mandatory Access Control system (e.g., apparmor or selinux) is implemented in warn/complain mode. Mandatory Access Control system (e.g., apparmor or selinux) is implemented in enforce mode, instead of warn/complain. Monitoring either doesn’t exist or it focuses on availability and the Operations team’s SLAs. The Security Team is able to detect the following in real time: software that runs in the environment as an unexpected service user, unexpected software in the environment including run times, and configuration file changes by any software or user other than the automation system. Logs are sent to a central location but are not relied on for real time system security monitoring. They can detect suspicious behavior like running debug tools or compilers, privilege escalation, and data access. This data is used for both incident response as well as changing internal behavior (i.e., remove the need for privilege escalation, system access, etc.). They can detect process execution patterns for unexpected behavior or remote code executions. Real time data about runtimes is used to automatically reconfigure parts of the infrastructure, such as automatically closing ports on firewalls, removing unused access for servers to infrastructure APIs, etc. You’re more than just a number — so what does this mean? Fill out the form below for a more detailed description of what’s behind your score and what it takes to move from one level to another.